Altyn Asyr (TM CELL) is the main national GSM-operator of Turkmenistan. The company is popular with customers due to low tariffs for services and high level of service. But for the successful termination and stable earnings, you need the most advantageous tariff plan. 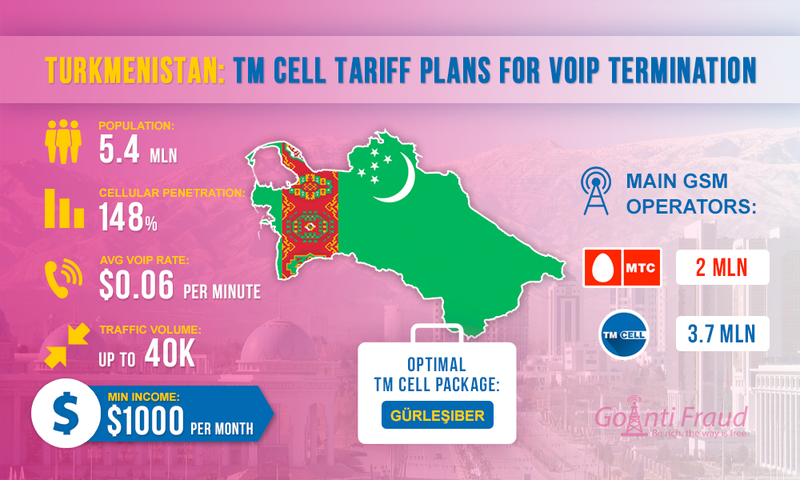 Offers to buy voip traffic in Turkmenistan can often be found on specialized forums, as well as offers of originator companies to provide traffic for termination in the country. Big amounts of traffic allow an owner of GSM gateways to make good money. TM CELL offers to its subscribers 6 prepaid packages. They are Sowgat 2000, Gürleşiber, Sada, Amatly, Tygşytly, and Çäksiz gepleşikler. Optimal TM CELL tariff plans for termination are Gürleşiber, Sowgat 2000, and Sada. The first one involves the binding daily subscription fee in the amount of $0.043, as well as one-time payment for connection of up to $1.43. When using this package, one minute of a local call will cost $0.0050 on the first day after you have connected and $0.00015 the next day. Sowgat 2000 is also suitable for voice traffic termination. It provides additional free calls within the network. When connected to 2000 Sowgat, you have 2,000 free minutes available. One minute within network costs about $0.0029. Using these packages terminators can earn at least $1,000 a month via one channel. For this purpose it is sufficient to place a GOIP 16 gateway in the central region of the country and protect the SIM-cards from being block by antifraud systems. To increase profits, many successful terminators tend to connect to GoAntiFraud. The company offers favorable business VoIP solutions - both for beginners and for professionals in this field. By using proven tools to bypass antifraud systems and user-friendly software to computerize the operation, your income will increase.